Pineapples are in season right now and costing about $2 each in my neck of the woods. YUM! A large pineapple will give me about four large servings for dessert (a mere 50 cents each). I have advocated for canned pineapple because it is cheap and already cut up - but this time of year is a good one for the fresh pineapple. First, you have to make friends with your pineapple. Grab a lovely green one and eat it soon after buying it - after you display it for all to admire. "Look, ma! A REAL pineapple!" Cut off the top and bottom - slice lengthwise into quarters - core - and slice along the spiky peel. I followed his directions and had 4 large hunks of pineapple in no time. If you practiced on a few pineapples - you could do this in a flash. Now, I suggest tasting it. Is it sweet? The one photographed above was so sweet that I had trouble not eating it before shooting. It didn't need anything to be a great snack all alone (without adulteration). If you find that it is too sour for you, then you can add some sugar to make it sweeter. I don't think that a little bit of sugar is a big deal when you are eating something as healthy as fresh pineapple. How do you serve pineapple? Core and peel pineapple into quarters (see above instructions). Heat broiler on high and put pineapple on a baking sheet. Heat for five minutes, remove from oven, and using a spoon rub one teaspoon of sugar onto each quarter. Serve with fork and knife and enjoy! yummy ideas, keep em coming! Grilled with cinnamon is my favorite way to eat pineapple. I had it that way at a Brazilian restaurant & I've been fixing it at home since then. You can cut off the outside, sprinkle it with cinnamon & then put it on the grill whole. Oh, & we never eat it green. If you let it sit on the counter for a few days, it will turn yellowish-brown. That's when it is ripe. If you let it ripen well, no sugar is needed! My husband was stationed in Hawaii for 4 years when he was in the Army before we met and he said that Hawaiians never eat them while still green. They can have a few darker soft spots kind of like on a banana and that's when they are the sweetest. I love grilled pineapple. YUmmy! Thanks...I usually do a terrible job in cutting up a pineapple and I wind up making a big mess...It actually does not look that hard. I read a hint about purchasing a ripe pineapple. I had mistakenly thought the old trick of being able to easily pull out a leaf was a sign of ripeness. Now I only buy a pineapple that smells like one! I look for the most golden one, and sniff the bottom. It should have that wonderful pineapple smell. A few days on the kitchen counter and its heavenly sweet. Go to Bed, Bath & Beyond and get a pineapple peeler/corer. They are wonderful!!! ENJOY! I love pineapple, it's so good and for some reason I love cutting them! There so good on the grill too!! We have lots of fresh pineapple in Australia all year around.I eat the core as well!! 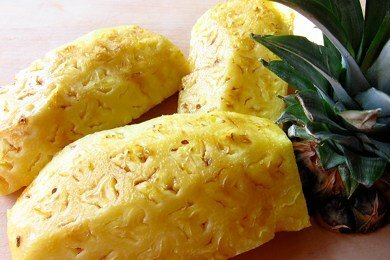 It contains more Bromelain which has great health benefits. Chewy but still nice.